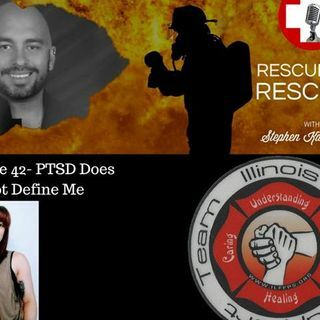 Join Former Chicago FD Paramedic Leah Siwinski and I discuss her journey from darkenss and innto the light. I began my EMS career in 2005 and later joined the Chicago Fire Department. My role as a paramedic and my desire to help others has always been more than just a job for me, it was a calling, it’s who I am. I have been called to many tragic scenes and have been on many stressful calls, but being a responding paramedic to a fatal call involving one of my own changed me. I was diagnosed ... See More with PTSD in 2014 and deemed “unfit” to work as a paramedic because of my diagnosis. Because of PTSD I have struggled with thoughts of suicide, symptoms of depression, self harm and other symptoms associated with PTSD, all while fighting to have my injury acknowledged by my department and my peers. In my search for support and assistance, I found resources for struggling first responders to be limited and in some cases non-existent. Because of my struggles I have made it my mission to ensure that no other first responder has to struggle alone. I am now the Executive Vice-President of Illinois Firefighter Peer Support and a first responder mental health advocate. I strive to make sure that no other first responder ever feels alone or unsupported. My goal is to educate both first responders and the general public on the prevalence of first responder mental health and what it can actually look like in those who struggle with it.